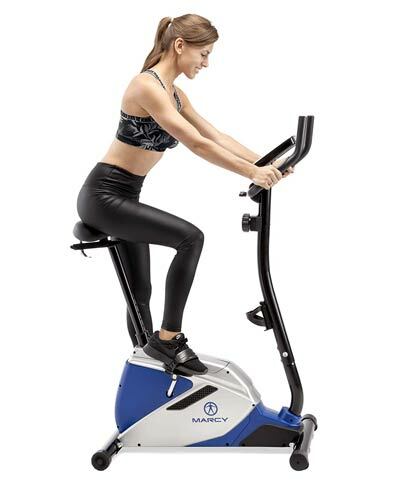 The Marcy ME-1016U is one of the exercise bikes released by Marcy Fitness in the second part of 2018. It is the upright version of the ME-1019R that we’ve already reviewed. It’s an entry-level exercise bike, but still, compared to the older Marcy NS-40504U, it offers a few extra features. These are the 4-way adjustable seat and the pulse reading function. 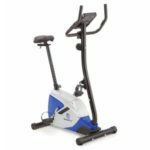 The Marcy ME-1016U upright exercise bike features a frame made of steel tubing. The only major ABS parts in its construction are the covers of the flywheel. All the steel bars in the composition of the frame feature a durable paint finish which is resistant to corrosion. The color of the powder coating used is black, this being the only color available for this unit. The plastic side covers combine silver, blue, and black. Although it has a steel frame, this Marcy exercise bike is far from being heavy. It weighs only 60 lbs (27.2 kg). This means it can be transported and assembled with ease by only one person. Plus, once the unit is fully assembled, the bike is very easy to relocate due to the wheels integrated into its front base. The bike does not have a folding frame like the XTERRA FB150, for example. However, it has quite a small footprint compared to other fitness machines. It takes approx. 33″L x 19.25″W (84 x 49 cm) of floor space. It is recommended, though, to leave at least two feet of clearance all around it, for safe operation. The frame does not have a step-through design. However, the front section of the frame casing is lower than the rest of it. Therefore, passing one foot over the base frame shouldn’t be too difficult even for users with certain disabilities. One last aspect to mention here regards the unit’s weight capacity. Several sources mention a user capacity for this Marcy upright bike of 300 lbs (136 kg). However, the unit’s manual indicates that it is designed to support users up to 250 lbs (113 kg) only. The Marcy ME-1016U is equipped with a 4-way adjustable seat. Its upright post offers several adjustment positions, while its horizontal slider allows a few extra front-to-back inches of adjustment. The upright post adjusts via a turn-knob close to its base, while the slider features a small lever which can easily lock and unlock the saddle closer or farther from the front part of the bike. These being said, the bike can accommodate users up to 6’2″ (188 cm) with no problem. 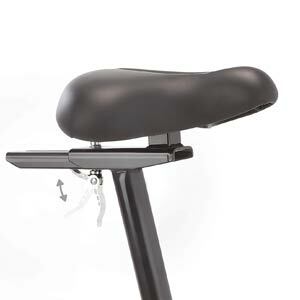 The included saddle is not consistently cushioned but does integrate a layer of foam cushioning. It has a flexible and durable upholstery. It’s also considerably wider than most seats included with spin bikes. Therefore, we can safely say that the seat is designed for optimal comfort. The front mast of the bike is non-adjustable. However, the angle of the handlebar can be adjusted. 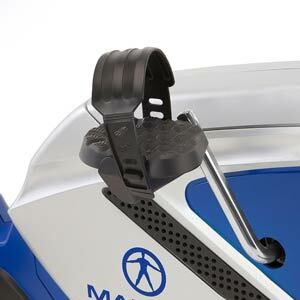 The handlebar attaches to the mast via a small knob which you can always loosen in order to change the position of the handlebar. The bike’s handlebar features a multi-grip design. It has a layer of rubber-foam material on top in order to provide a better grip and optimal comfort. Also, its side grips integrate pulse sensors while the included bike computer can track your pulse rate. The older Marcy upright bike versions, such as the NS-1201U or the NS-714U do not have this feature. 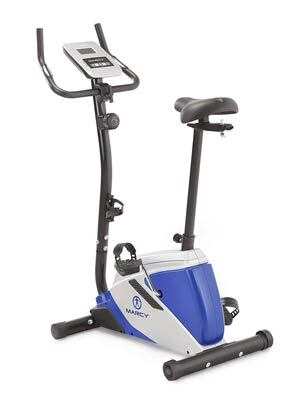 The Marcy ME-1016U upright bike features an internal belt drive system. It uses a heavy-duty v-belt resistant to stretching and abrasion. It does not require any lubrication and also delivers a very quiet (almost completely silent) pedaling motion. The bike’s internal flywheel is perimeter-weighted. Therefore, it offers a pretty consistent momentum and a steady pedaling motion. The weight of the flywheel is not specified. However, considering that the total weight of the unit isn’t more than 60 lbs (27.2 kg), the flywheel shouldn’t weigh more than 20 lbs (9 kg). The flywheel is also bi-directional. Therefore, you can pedal in reverse if you want. But when pedaling in reverse, the resistance will remain constant. 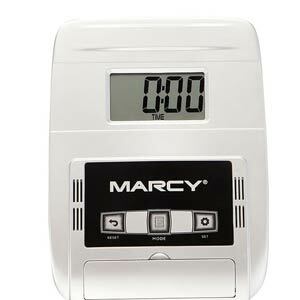 This Marcy exercise bike integrates a mechanical magnetic resistance system. It consists of an internal brake pad which is connected to the tension knob on the front mast of the bike through a steel wire. Therefore, when you turn the knob clockwise, the brake pad will move closer to the flywheel which increases the intensity of the magnetic field and produces more resistance. These being said, the bike does not require an external power source. Also, the console does not play any role in the resistance adjustment. The bike makes available 8 levels of resistance. The first two levels deliver little pedaling difficulty, so they’re great for recovery training or conditioning. The 8th level, on the other hand, provides a considerably higher resistance simulating a hill climb. The bike’s crankset is quite durable, featuring solid steel arms. However, since this is not a spin bike, it’s not made for standing on the pedals. Thus, even though it may support your whole weight, pedaling while standing up is not recommended, because it may result in severe wear and tear on the internal parts. The included pedals have a metallic core, a nylon top, and a weight element on the bottom. Therefore, they always turn up when you remove your feet from them. They have a non-slip surface and adjustable straps as well. However, they do not have SPD elements for spin shoes. The bike’s console does not have any online connectivity, Bluetooth, or preset programs. However, it does have goal setting functions and tracks the most important workout metrics. It features an LCD display which indicates distance, total distance, time elapsed, speed, calories, and pulse. For the pulse reading, you have to use the sensors incorporated into the handlebar; the unit is not telemetric and cannot read your pulse through a chest band transmitter. Also, speed and distance are only shown in imperial units (MPH and miles); you cannot set them to metric. The console unit is very easy to use. It has three buttons. These are Mode, Set, and Reset. The Mode button allows you to select one of the metrics to be shown on the display, or select the Scan Mode which rotates all the metrics showing each onr for 6 seconds. The Set button allows you to set up values for time, distance, calories, and pulse. When a value is set for the first three, the meter will countdown until it reaches zero. Conversely, if you set up a value for the pulse, the console will emit a beep if your pulse falls under the selected value. And finally, the Reset button allows you to clear all the values on the console to zero. The bike’s console requires two AA (1.5 V) batteries which are included. It starts up when you begin pedaling or when you press the Mode button. It also automatically shuts down after four minutes of inactivity on the bike. Last but not least, the console is equipped with a foldable device holder. It is placed at the bottom of the unit and is wide enough to support any tablet or smartphone. There are no USB ports or Aux ports to connect your devide, though. This Marcy exercise bike is very easy to put together. In fact, its main body with the drive and resistance elements is already assembled. The only parts that need assembly are the base bars, the seat post, the saddle, the pedals, the console mast, the handlebars, and the console. You also have to connect the brake cable, to the extension cable on the tension knob. The whole task shouldn’t take more than one hour. The manual provides all the necessary assembly instructions and a basic toolkit is also included. For maintenance, you only have to keep the bike clean and periodically check for loose parts. The internal mechanism should not need any maintenance for a long period of time. The calorie reading is not too accurate. The Marcy ME-1016U is an upright exercise bike designed for home use. It features a manual magnetic resistance system, a quiet belt drive, and a console which tracks the most important workout metrics. It also offers better micro-adjustability than other upright bikes, as its seat is 4-way adjustable and the handlebars are angle-adjustable. It’s an excellent trainer for muscle toning, stamina development, recovery training, weight loss, and in general, for light cardio training. It’s also an affordable exercise bike, currently available for less than $250.